The Anterior Cruciate Ligament (ACL) is a key structure in the knee joint, as it resists anterior tibial translation and rotational loads. It is one of the most frequently injured structures during high impact or sporting activities. The ACL does not heal when torn, and surgical reconstruction is the standard treatment in the field of sports medicine. Such reconstruction aims at restoring the kinematics and stability of the injured knee, to prevent future degenerative changes. Therefore, an adequate understanding of the complex anatomy, function, and biomechanics of the ACL is critical to elucidate the mechanisms of injury, understand the fate of chronic ACL deficiency, and to improve surgical reconstruction. The literature becomes confusing when the fascicular anatomy is categorised. Welsh (1980) and Arnoczky (1983) described the ACL as being the single broad continuum of fascicles, with different portions taut throughout the range of motion. However functionally, Girgis et al. divided the ACL into two parts, the anteromedial bundle (AMB) and the posterolateral bundle (PLB),  while other authors have separated the ACL in three functional bundles (AMB, intermediate band, and PLB). A recent study that utilised MRI deception and 3D visualisation observed three bundles in 22 knees (92%) and two bundles in 2 knees (8%) of the study subjects. However, the two bundle model has been generally accepted as the best representation to understand ACL function. While the two group designation provides a general idea as to the dynamics of the ACL through the range of motion, it oversimplifies somewhat. While a functional AMB is defined in flexion and a PLB is present in extension, the ACL is actually a continuum of fascicles, a different portion of which is taut throughout the range of motion. This is of great clinical importance, because in any position of the knee, a portion of the ACL remains under tension and functional. Recently, Zantop et al. suggested a classification of intra-articular rupture pattern of the ACL with regards to its two bundles. This classification consists out of an alphanumeric code with letters for the location of the AM bundle rupture and numbers for the location of the PL bundle rupture. Femoral rupture location for the AM bundle is graded 1, mid-substance rupture is graded 2 and a tibial rupture of the AM bundle is graded 3. An elongated, functional insufficient AM bundle is graded 4 and an intact AM bundle 5. For the PL bundle, a rupture at the femoral origin, the mid-substance or the tibial insertion is graded A, B, and C, respectively. Elongated PL bundles are graded as D and intact PL bundle as E. The intra-operatively assessed rupture pattern of the AM and PL bundle can be expressed using this alphanumeric code; for example, 1A for a femoral rupture of the AM and a femoral rupture of the PL bundle. The validity and reliability of a possible classification is currently in development. The proximal part, which is less solid, is highly cellular, rich in round and ovoid cells, containing some fusiform fibroblasts, collagen type II and glycoproteins such as fibronectin and laminin. The middle part, containing fusiform and spindle shaped fibroblasts, is a high density of collagen fibres, a special zone of cartilage and fibrocartilage (especially in the anterior part where the ligament faces the anterior rim of the intercondylar notch), and elastic, and oxytalan fibres. The oxytalan fibres withstand modest multidirectional stresses, while elastic fibres absorb recurrent maximal stress. The fusiform and spindle-shaped fibroblasts are prominent in this middle part, which is also named the fusiform zone, and is located in the middle part and the proximal one-quarter of the ligament. The distal part, which is the most solid, is rich in chondroblasts and ovoid fibroblasts, and with a low density of collagen bundles. The fibroblasts, located on either side of the collagenous bundles are round to ovoid and resemble the cells of articular cartilage. In the anterior portion of the ACL, approximately 5–10 mm proximal to the tibial attachment, a layer of dense fibrous tissue surrounds the ligament instead of synovial tissue. This area corresponds to the zone where the ligament impinges on the anterior rim of the femoral intercondylar fossa in full knee extension. Also recently, Chen et al. presented a human ACL model to evaluate the mechanical unloading effects on the histologic changes of ligament tissues over time. Testing variables included fibroblast density, crimp amplitude, and crimp nuclear shape. The authors observed the sequential changes: Fibroblast density significantly increased within 5–6 weeks of unloading. By 7–8 weeks, crimp amplitude significantly decreased, accompanied by formation of irregular fibre patterns and fragments. This was followed by crimp wavelength and nuclear shape change from spindle to ovoid within 9–14 weeks. According to the literature, physical loadings provide an important stimulus for maintaining the normal structure and function of ligament tissue. Gene expression of type I and III collagen is also stimulated by mechanical stretch in ACL cells, via up-regulation of the transforming growth factor (TGF)-b1. Therefore authors emphasised the important concept of early implementation of mechanical force in rehabilitation programs for patients with injured ligaments to prevent the deleterious effects due to mechanical unloading. The fibre bundles of the ACL do not function as a simple band of fibres with constant tension; in fact, they show a different tensioning pattern throughout a full range of motion. The differentiation of the ACL into two functional bundles, the anteromedial bundle (AMB) and posterolateral bundle (PLB), seems an oversimplification, but the two bundle description of the fibres of the ACL has widely been accepted as a basis for the understanding the function of the ACL. The terminology of the bundles was chosen according to their tibial insertion with the fibres of the AMB originating in the most proximal part of the femoral origin of the AMB and inserting at the anteromedial tibial insertion. As mentioned earlier, the role of AMB and PLB in restraining the anterior tibial translation is determined by their tensioning patterns throughout passive flexion–extension. Sakane et al. have shown that in response to 134 N anterior tibial load, the forces taken up by the PLB are higher in lower flexion degrees when compared to the AMB. The AMB, however, was shown to take up more of the applied external force in higher flexion angles. Using a liquid metal strain gage, Bach et al. reported higher strain in the PLB than in the AMB in knee flexion below 200. A biomechanical study conducted on human cadavers reported insignificant increase in anterior tibial translation following partial tear of AM or PL bundles . The reciprocal function between the two bundles remains inconclusive in the literature. A recent study was performed using a robotic/universal force moment sensor and underlined the importance of the PLB. In this study, the in situ forces of PLB in response to a 134 N anterior load were highest in full extension and decreased with increasing flexion. These authors further demonstrated that the PLB plays a significant role in the stabilisation of the knee against a combined rotatory load. A recent in vivo study using radiographic stereophotogrammetric analysis (RSA) evaluated the knee kinematics of ACL-reconstructed (single bundle technique) and uninjured (contralateral) knees of six subjects during downhill running. The authors concluded that single bundle ACL reconstruction failed to restore normal rotational knee kinematics during dynamic loading. In conclusion, there seems to be some agreement favouring the hypothesis that the PLB is more of a restraint to tibial rotation than the AMB. Following ACL rupture, rotational axis of the knee is altered compromising internal rotational instability. As a result, movement at the postero-lateral component is increased by up to 413% at 15° of knee flexion. Level walking, ascending and descending stairs were found to exert the highest shear forces on ACL compared to other activities such as sitting down, standing up and knee bending activities. Recently, Zaffagnini et al. performed a qualitative and quantitative histological evaluation, by transmission electron microscopy (TEM), of the neoligamentisation process of a autologous bone-patellar tendon-bone (BTPB) graft used as pro-ACL at different follow-up times. Their results showed that up to 24 months follow-up, progressive ultrastructural changes towards the normal ACL are observed. At longer times after surgery (48 and 120 months) no further changes were evident and the ultrastructure showed a marked reduction in large fibrils, which was typical of the control patellar tendon, and a significant increase in small fibrils. The ultrastructure seemed to combine fibrils from two different morphological units. The BPTB graft used as ACL underwent a transformation process for up to two years. After that period the transformation ceased and for ten years failed to reach the ultrastructural aspect of a normal ACL. However, from an architectural point of view the graft slowly transformed into a structure similar to ACL with respect to the different mechanical stresses the ligament has to sustain. Similar study with autologous hamstring graft is in progress. A study that investigated the molecular characteristics of knee extensors following ACL-reconstruction found reduced slow fibre percentage, lowered mitochondria fibre density and capillary-to-fibre ratio particularly in vastus lateralis muscle up to 5 years after surgery. ↑ 1.0 1.1 Matsumoto, H., Suda, Y., Otani, T., Niki, Y., Seedhom, B. B., Fujikawa, K. (2001). Roles of the anterior cruciate ligament and the medial collateral ligament in preventing valgus instability. J Orthop Sci, 6(1), 28-32. ↑ Van Den Bogert, A. J., McLean, S. G. (2007). ACL injuries: do we know the mechanisms? J Orthop Sports Phys Ther, 37(2), A8-9. ↑ 3.0 3.1 Bach, B. R., Jr., Levy, M. E., Bojchuk, J., Tradonsky, S., Bush-Joseph, C. A., Khan, N. H. (1998). Single-incision endoscopic anterior cruciate ligament reconstruction using patellar tendon autograft. Minimum two-year follow-up evaluation. Am J Sports Med, 26(1), 30-40. ↑ Freedman, K. B., D'Amato, M. J., Nedeff, D. D., Kaz, A., Bach, B. R., Jr. (2003). Arthroscopic anterior cruciate ligament reconstruction: a metaanalysis comparing patellar tendon and hamstring tendon autografts. Am J Sports Med, 31(1), 2-11. ↑ 5.0 5.1 Lohmander, L. S., Ostenberg, A., Englund, M., Roos, H. (2004). High prevalence of knee osteoarthritis, pain, and functional limitations in female soccer players twelve years after anterior cruciate ligament injury. Arthritis Rheum, 50(10), 3145-3152. ↑ Petersen, W., Laprell, H. (2000). Insertion of autologous tendon grafts to the bone: a histological and immunohistochemical study of hamstring and patellar tendon grafts. Knee Surg Sports Traumatol Arthrosc, 8(1), 26-31. ↑ 7.0 7.1 7.2 7.3 7.4 Zantop, T., Petersen, W., Sekiya, J. K., Musahl, V., Fu, F. H. (2006). Anterior cruciate ligament anatomy and function relating to anatomical reconstruction. Knee Surg Sports Traumatol Arthrosc, 14(10), 982-992. ↑ 8.0 8.1 8.2 Petersen, W., Tillmann, B. (2002). [Anatomy and function of the anterior cruciate ligament]. Orthopade, 31(8), 710-718. ↑ Tena-Arregui, J., Barrio-Asensio, C., Viejo-Tirado, F., Puerta-Fonolla, J., Murillo-Gonzalez, J. (2003). Arthroscopic study of the knee joint in fetuses. Arthroscopy, 19(8), 862-868. ↑ Ellison, A. E., Berg, E. E. (1985). Embryology, anatomy, and function of the anterior cruciate ligament. Orthop Clin North Am, 16(1), 3-14. ↑ 11.0 11.1 11.2 11.3 11.4 11.5 11.6 11.7 Girgis, F. G., Marshall, J. L., Monajem, A. (1975). 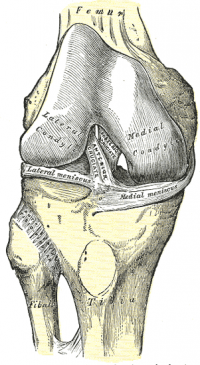 The cruciate ligaments of the knee joint. Anatomical, functional and experimental analysis. Clin Orthop Relat Res(106), 216-231. ↑ 12.0 12.1 Amis, A. A., Dawkins, G. P. (1991). Functional anatomy of the anterior cruciate ligament. Fibre bundle actions related to ligament replacements and injuries. J Bone Joint Surg Br, 73(2), 260-267. ↑ Harner, C. D., Livesay, G. A., Kashiwaguchi, S., Fujie, H., Choi, N. Y., Woo, S. L. (1995). Comparative study of the size and shape of human anterior and posterior cruciate ligaments. J Orthop Res, 13(3), 429-434. ↑ Harner, C. D., Baek, G. H., Vogrin, T. M., Carlin, G. J., Kashiwaguchi, S., Woo, S. L. (1999). Quantitative analysis of human cruciate ligament insertions. Arthroscopy, 15(7), 741-749. ↑ 15.0 15.1 Arnoczky, S. P. (1983). Anatomy of the anterior cruciate ligament. Clin Orthop Relat Res(172), 19-25. ↑ 16.0 16.1 Welsh, R. P. (1980). Knee joint structure and function. Clin Orthop Relat Res(147), 7-14. ↑ Hollis, J. M., Takai, S., Adams, D. J., Horibe, S., Woo, S. L. (1991). The effects of knee motion and external loading on the length of the anterior cruciate ligament (ACL): a kinematic study. J Biomech Eng, 113(2), 208-214. ↑ Otsubo H, Akatsuka Y, Takashima H, Suzuki T, Suzuki D, Kamiya T, Ikeda Y, Matsumura T, Yamashita T, Shino K. MRI depiction and 3D visualization of three anterior cruciate ligament bundles. Clinical Anatomy. 2017 Mar;30(2):276-83. ↑ 19.0 19.1 Markolf, K. L., Mensch, J. S., Amstutz, H. C. (1976). Stiffness and laxity of the knee--the contributions of the supporting structures. A quantitative in vitro study. J Bone Joint Surg Am, 58(5), 583-594. ↑ Zantop, T., Brucker, P. U., Vidal, A., Zelle, B. A., Fu, F. H. (2007). Intraarticular rupture pattern of the ACL. Clin Orthop Relat Res, 454, 48-53. ↑ Zaffagnini, S., Golano, P., Farinas, O., Depasquale, V., Strocchi, R., Cortecchia, S., et al. (2003). Vascularity and neuroreceptors of the pes anserinus: anatomic study. Clin Anat, 16(1), 19-24. ↑ Fu, F. H., Bennett, C. H., Lattermann, C., Ma, C. B. (1999). Current trends in anterior cruciate ligament reconstruction. Part 1: Biology and biomechanics of reconstruction. Am J Sports Med, 27(6), 821-830. ↑ 23.0 23.1 Dienst, M., Burks, R. T., Greis, P. E. (2002). Anatomy and biomechanics of the anterior cruciate ligament. Orthop Clin North Am, 33(4), 605-620. ↑ 24.0 24.1 Pitaru, S., Aubin, J. E., Bhargava, U., Melcher, A. H. (1987). Immunoelectron microscopic studies on the distributions of fibronectin and actin in a cellular dense connective tissue: the periodontal ligament of the rat. J Periodontal Res, 22(1), 64-74. ↑ 25.0 25.1 25.2 25.3 Petersen, W., Tillmann, B. (1999). Structure and vascularization of the cruciate ligaments of the human knee joint. Anat Embryol (Berl), 200(3), 325-334. ↑ Skelley NW, Lake SP, Brophy RH. Microstructural properties of the anterior cruciate ligament. Annals of Joint. 2017 May 23;2(5). ↑ 27.0 27.1 Kim, S. G., Akaike, T., Sasagaw, T., Atomi, Y., Kurosawa, H. (2002). Gene expression of type I and type III collagen by mechanical stretch in anterior cruciate ligament cells. Cell Struct Funct, 27(3), 139-144. ↑ 28.0 28.1 Lee, C. Y., Smith, C. L., Zhang, X., Hsu, H. C., Wang, D. Y., Luo, Z. P. (2004). Tensile forces attenuate estrogen-stimulated collagen synthesis in the ACL. Biochem Biophys Res Commun, 317(4), 1221-1225. ↑ Smith, B. A., Livesay, G. A., Woo, S. L. (1993). Biology and biomechanics of the anterior cruciate ligament. Clin Sports Med, 12(4), 637-670. ↑ 30.0 30.1 30.2 Woo, S. L., Gomez, M. A., Seguchi, Y., Endo, C. M., Akeson, W. H. (1983). Measurement of mechanical properties of ligament substance from a bone-ligament-bone preparation. J Orthop Res, 1(1), 22-29. ↑ Chen, C. H., Liu, X., Yeh, M. L., Huang, M. H., Zhai, Q., Lowe, W. R., et al. (2007). Pathological changes of human ligament after complete mechanical unloading. Am J Phys Med Rehabil, 86(4), 282-289. ↑ 32.0 32.1 Sakane, M., Fox, R. J., Woo, S. L., Livesay, G. A., Li, G., & Fu, F. H. (1997). In situ forces in the anterior cruciate ligament and its bundles in response to anterior tibial loads. J Orthop Res, 15(2), 285-293. ↑ Kondo E, Merican AM, Yasuda K, Amis AA. Biomechanical analysis of knee laxity with isolated anteromedial or posterolateral bundle–deficient anterior cruciate ligament. Arthroscopy: The Journal of Arthroscopic & Related Surgery. 2014 Mar 1;30(3):335-43. ↑ Domnick C, Raschke MJ, Herbort M. Biomechanics of the anterior cruciate ligament: Physiology, rupture and reconstruction techniques. World journal of orthopedics. 2016 Feb 18;7(2):82. ↑ 35.0 35.1 35.2 Gabriel, M. T., Wong, E. K., Woo, S. L., Yagi, M., Debski, R. E. (2004). Distribution of in situ forces in the anterior cruciate ligament in response to rotatory loads. J Orthop Res, 22(1), 85-89. ↑ Tashman, S., Collon, D., Anderson, K., Kolowich, P., Anderst, W. (2004). Abnormal rotational knee motion during running after anterior cruciate ligament reconstruction. Am J Sports Med, 32(4), 975-983. ↑ Amis AA, Bull AM, Lie DT. Biomechanics of rotational instability and anatomic anterior cruciate ligament reconstruction. Operative Techniques in Orthopaedics. 2005 Jan 1;15(1):29-35. ↑ Kanamori A, Sakane M, Zeminski J, Rudy TW, Woo SL. In-situ force in the medial and lateral structures of intact and ACL-deficient knees. Journal of orthopaedic science. 2000 Nov 1;5(6):567-71. ↑ 39.0 39.1 39.2 39.3 39.4 39.5 Woo, S. L., Hollis, J. M., Adams, D. J., Lyon, R. M., Takai, S. (1991). Tensile properties of the human femur-anterior cruciate ligament-tibia complex. The effects of specimen age and orientation. Am J Sports Med, 19(3), 217-225. ↑ Takeda, Y., Xerogeanes, J. W., Livesay, G. A., Fu, F. H., Woo, S. L. (1994). Biomechanical function of the human anterior cruciate ligament. Arthroscopy, 10(2), 140-147. ↑ Butler, D. L., Kay, M. D., Stouffer, D. C. (1986). Comparison of material properties in fascicle-bone units from human patellar tendon and knee ligaments. J Biomech, 19(6), 425-432. ↑ Butler, D. L., Guan, Y., Kay, M. D., Cummings, J. F., Feder, S. M., Levy, M. S. (1992). Location-dependent variations in the material properties of the anterior cruciate ligament. J Biomech, 25(5), 511-518. ↑ 43.0 43.1 Wilson, T. W., Zafuta, M. P., Zobitz, M. (1999). A biomechanical analysis of matched bone-patellar tendon-bone and double-looped semitendinosus and gracilis tendon grafts. Am J Sports Med, 27(2), 202-207. ↑ Weiler, A., Hoffmann, R. F., Bail, H. J., Rehm, O., Sudkamp, N. P. (2002). Tendon healing in a bone tunnel. Part II: Histologic analysis after biodegradable interference fit fixation in a model of anterior cruciate ligament reconstruction in sheep. Arthroscopy, 18(2), 124-135. ↑ Draganich, L. F., Vahey, J. W. (1990). An in vitro study of anterior cruciate ligament strain induced by quadriceps and hamstrings forces. J Orthop Res, 8(1), 57-63. ↑ Yasuda, K., Sasaki, T. (1987). Exercise after anterior cruciate ligament reconstruction. The force exerted on the tibia by the separate isometric contractions of the quadriceps or the hamstrings. Clin Orthop Relat Res(220), 275-283. ↑ Dubljanin-Raspopovic, E., Kadija, M., Matanovic, D. (2005). [Basic principles of aggressive rehabilitation after anterior cruciate ligament reconstruction]. Srp Arh Celok Lek, 133(11-12), 528-531. ↑ Marieswaran M, Jain I, Garg B, Sharma V, Kalyanasundaram D. A Review on Biomechanics of Anterior Cruciate Ligament and Materials for Reconstruction. Applied bionics and biomechanics. 2018;2018. ↑ 49.0 49.1 Zaffagnini, S., De Pasquale, V., Marchesini Reggiani, L., Russo, A., Agati, P., Bacchelli, B., et al. (2007). Neoligamentization process of BTPB used for ACL graft: histological evaluation from 6 months to 10 years. Knee, 14(2), 87-93. ↑ Okahashi, K., Sugimoto, K., Iwai, M., Oshima, M., Samma, M., Fujisawa, Y., et al. (2006). Regeneration of the hamstring tendons after harvesting for arthroscopic anterior cruciate ligament reconstruction: a histological study in 11 patients. Knee Surg Sports Traumatol Arthrosc, 14(6), 542-545. ↑ Nebelung, W., Becker, R., Urbach, D., Ropke, M., Roessner, A. (2003). Histological findings of tendon-bone healing following anterior cruciate ligament reconstruction with hamstring grafts. Arch Orthop Trauma Surg, 123(4), 158-163. ↑ Flück M, Viecelli C, Bapst AM, Kasper S, Valdivieso P, Franchi MV, Ruoss S, Lüthi JM, Bühler M, Claassen H, Hoppeler H. Knee extensors muscle plasticity over a 5-years rehabilitation process after open knee surgery. Frontiers in physiology. 2018;9.